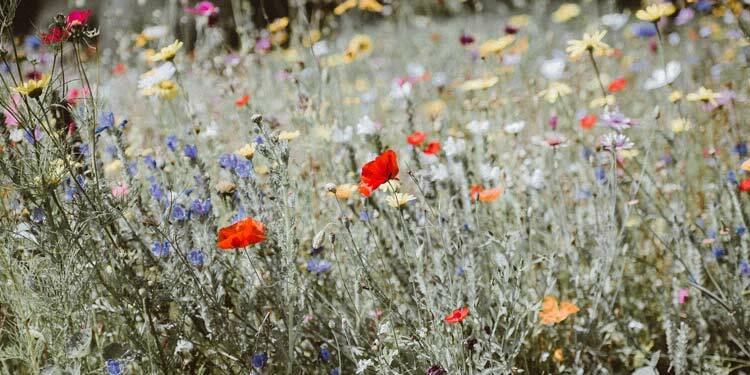 Your seed packets contain Baby Blue Eyes, Black-Eyed Susan, Candytuft, Catchfly, Corn Poppy, English Daisy, Five Spot, Gloriosa Daisy, Scarlet Flax, Siberian Wallflower, Sweet William Pinks, Tall Spurred Snapdragon, and Zinnia seeds. Plant your seeds in the late spring/summer/early fall, or when the soil temps reach a minimum of 55 degrees (this is very important, the seeds will not germinate if the ground is below this temperature), in a sun-exposed area (the sunnier the better) that gets at least 6 hours of sunlight a day. Ideas on where you can plant your seeds – define property boundaries by planting around the edge of your yard; help control erosion by planting along steep banks and slopes; create a colorful oasis where you can sit back and relax. A little bit of soil preparation goes a long way- remove all existing growth and debris and rough up the area with a rake to loosen the top three inches of soil, creating a softened bed for planting your seeds. Once your soil is bare and loose (and the air is calm- you don’t want your seeds blowing away), you’ll want to evenly spread the seeds on the ground. One handy trick for evenly distributing the seeds is to mix them in with dry sand (about 1 part seeds to 8 parts dry sand). This will ensure an even application of seeds and will avoid clusters of seeds which inhibits growth. The time of day when you plant the seeds is not so important as making sure the temperature of the soil is warm enough (55) and the sun isn’t scalding. Planting in the evening/when the sun is setting can be an ideal time so that the air has cooled down and the earth is still warm. After you have sprinkled the seeds evenly over the ground, it is crucial to compress them into the ground to encourage germination. You can use your hands, bare feet or shoes to firmly press the seeds into the soil. Once you sow your seeds, it is vital that the soil be kept moist and well-watered until the seedlings reach 4-6 inches tall. After planting, water the entire area thoroughly with a gentle spray. You should start to see your seedlings appear within 21 days. As they grow and mature, it may be tricky to differentiate them from small weeds, so be patient and try not to pull anything out, or familiarize yourself with your local weeds and learn how to identify what’s what in the early stages. Try to check on your seedlings twice a day to make sure the ground is not dangerously dry. When your wildflower seedlings have reached 6 inches in height, they’ll become self-sufficient and will only need supplemental water in the event of a long dry spell or drought. When weeding, it may be difficult to pull weeds without harming the wildflowers. In this case, snipping away the weeds with scissors will do the trick. Enjoy the flowers of your labor! Grow your families health with our NUNM Health Centers, offering integrative medical care by highly qualified, licensed naturopathic physicians and acupuncturists, and their finest medical interns – all working together to bring you the best care possible. We address a full-range of health needs from allergies, cold/flu, diabetes, digestive disorders, family planning, healthy aging, heart disease, hormone imbalances, immunizations, nutrition, pain management, pediatric/well baby exams, preventative care, skin care, STD’s and more.